Previewing is a great way to see the changes you've made to your Articulate Engage interaction without publishing it. Click the Preview button on the Engage ribbon. Click the drop-down arrow below the Preview button, and choose From beginning. Press Ctrl+F12 on your keyboard. Click the drop-down arrow below the Preview button, and choose From this step. Select: This lets you choose a different step in your interaction to preview. Replay: Click this button to play the current step again. 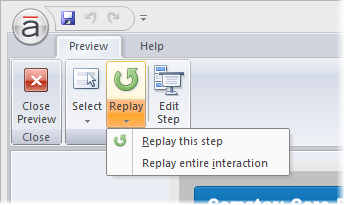 To replay the interaction from the beginning, click the drop-down arrow, and choose Replay entire interaction. 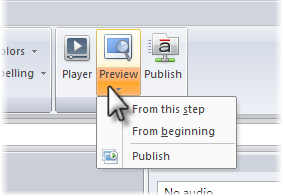 Edit Step: This closes the Preview window and takes you to the current step in the editor. Though most content displays during preview just like it would in the published output, there are a couple of items that are unavailable during preview. Hyperlinks may not work during preview. We recommend that you publish your interaction to test hyperlinks.